Find out more about booking and organising your trip, safety, who travels with us and more. 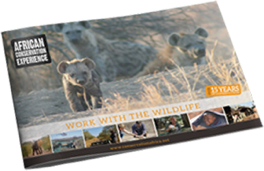 Find out what we do and how conservation volunteering works. Our goal is to make conservation travel accessible to everyone. Find out about our inclusive accommodation and food. How physically demanding is an experience. Our rhino ratings hold the answer. From picking an experience to packing your bags, we’re here to help. Find out what’s included in our experiences and how to pay. You can fundraise some or all your prices. Here’s how we can help. Wherever you’re travelling from, we can help you plan and book your journey. Do you have a question about medical issues in southern Africa? Find out how we keep you safe throughout your trip. Your all-important travel documents. Here’s what you need to know. WANT TO ASK US INSTEAD? If you can’t find the answer to your question in our FAQs, get in touch and ask our team. Whatever you want to know, we’re always happy to help.